To the raucous cheers from fans who had traveled to the event, Carolin Klöckner proudly accepted her new crown and congratulations from all quarters. The 23-year-old Student of agrarian sciences from Hohenheim University had already demonstrated deep knowledge and commitment during the preliminary rounds, and proved just as adapt and eloquent in the thrilling finale. Her performance won the hearts of the nearly 800 spectators and the minds of the expert jury at the Saalbau in Neustadt an der Weinstraße. As the 70th German Wine Queen, she now holds a commission from The German Wine Institute (DWI /Wines of Germany) to spend a year fulfilling more than 200 appointments in Germany and abroad as an ambassador for German wine (Instagram). At the gala election ball, which was broadcast live on SWR Fernsehen, Carolin Klöckner prevailed over five fellow aspirants, building on her successful appearance a week earlier that had earned her a spot in the finale. Over the course of multiple rounds of competition, the six young wine experts demonstrated their skills in wine sensorics, rhetoric and communications. Their first task: providing commentary on their own introductory clips and working through blind wine tastings. Next came a game-show style quiz that required them to guess the wine preferences and habits of random people off the street. Once the jury whittled the selection down to three finalists, the big remaining question was who would wear which wine crown. Beside other tasks the contestants had to come up with a spontanious speech with random wine terms that were unknown to them until their performance on stage. Another challenge called for each of the three candidates to hold a one-minute talk about a personal photo. Klara Zehnder radiated a charm and natural calm that carried the day. The highest honor of German wine royalty will thus return to the Württemberg region, where Helga Drauz (Heilbronn) wore it 1986/1987. 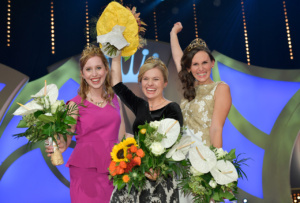 Klara Zehnder from Franken (Franconia) in Bavaria and Inga Storck from the Pfalz region accepted the princess crown with “tremendous pride.” “We’re simply thrilled about everything that lies ahead,” the declared.